I really couldn't think of a name for this post other than the obvious of I have packing. especially for a trip like this, the kind that you don't know exactly what you are going to be doing each day. For a resort down south I would just back Bikinis and slutty, oops I mean beachy dresses. Not really the look I am going for while visiting my Gramps. Ok a few things I know, more undies than days, heaps of sun screen and toiletries. But how many tee's, shorts, dresses and pants. Whats the weather going to be like, hot, cold, wet or dry. How much of the drive am I going to need my winter jacket for and boots... do I wear boots. If I were a rich girl I would just buy what I need down there, but I'm not so I need to bring it. I know I am going to forget something important, something vital to my survival. I mean when going to New York I forgot the guide to New York that I bought. The one nice thing about this trip is that my Daddy does all the booking, I just need to be up at 3am to be ready for 4. Why do parents always make you leave before its even day outside, before Starbucks is open?? Even with theses dilemmas I'm excited, looking forward to all the Vitamin D I can soak up!! 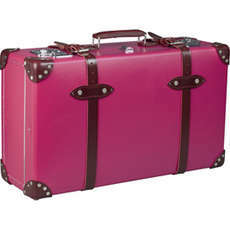 If I was a rich girl I'd buy that pink suitcase. Me Too!! I hope it had wheels though..
Or if they made it in purse size...that would be cute.